Note: As of 2/16/17 this seems to no longer be working. Have you started using the new Inbox by GMail, but have been feeling a little lost because you can't assign an email to multiple bundles. Well, guess what? You can assign an email to multiple bundles upon receipt. I know, you are saying to yourself, this is great, but how do I do that. Here are the steps using two Bundles I created called Test 1 and Test 2. Setup the two bundles as shown in the images below. Now when you get an email sent you you meeting this criteria, you Inbox will look like this. If the email is already in your Done or other Bundle, you can assign multiple labels with a little bit of a workaround. Go into the Done bundle and find the email you want to assign to additional labels. Select the email and use the Move to function to add to another bundle. You will need to repeat this step for each additional bundle you want to assign. Its important to remember, that GMail/Inbox by GMail only stores your email once, no matter how many Bundles/Labels you have assigned to it. So you don't have to worry about more space being used because the email appears in multiple bundles. Thank you very much for trying to help. That's generous. But why in the world would Google make us do somersaults to attach two labels to a single email? That is the single unique and one of the most useful attributes of the Google mail universe. Really sad! The app is quite nice, but because of this I'm ditching it. Jeff it is my belief that inbox is more about getting things done and using search to find emails than about using multiple labels and bundles like in classic gmail. When I switched to inbox from gmail, I deleted every single one of my labels (including multple nested labels) and I have found that i dont miss them at all. Totally agree jeffsf! Love the inbox app, but hate the extra hassle of trying to assign multiple labels... sticking with normal gmail, until this changes! Scott - This is such a good answer. I've struggled a bit sometimes wrapping my head around trying to re-label things (especially because now I'm using the feature where you can send articles/links to Inbox) to categorize them. However, the search is so powerful, labeling them pretty much doesn't matter. I appreciate the workaround, but I think I'll abandon the thought and continue to use the search. More power to you, but the one-size-fits-all, Google-knows-better-than-the-user, just-do-it-our-way philosophy rankles. Once of the great things about living in our time is the many choices technology offers for each person to craft something that works for them, so I'm disappointed to see a retreat into our-way-or-the-highway. Hey jeffsf, Google offers GMail as well as Inbox. I see them innovating and giving us choices. I would VERY much like to have multiple labels. It's important to the way I work. I've tried using the "workaround" to assign multiple labels to one message, but it just keeps moving the one message from one label to the other and back again. I cannot get it to assign both labels to the same message. If this functionality is truly lost, I will likely be switching back to the old Gmail app by the end of the day. Definitely a dealbreaker. Valerie the workaround works for me still. Are you looking at the assigning to new emails as they come in or are you trying to assign emails you already have? I have the same issue and am struggling to assign multiple labels to an already "done" email that is already assigned to a label. Did you select the email in Done, then move to label 1, then do it a second time to Label 2? Then take a look in each label and you should see the email there. I just tested that and it is working as described. Wait, I understand how to do it now. So soon after saying I didn't! You have to actually click on the done option (with green tick next to it) at top of bundles menu. NOT one of your existing labels! That way (for some reason) moving actually works as tagging. That is correct - it has to be done from the Done label for it to work. This behaviour seems to be accidental so I hope they don't remove it. They should make it into a feature. I must say the assignment workaround doesn't work for me now even if I try to do it from the Done label. Is it only me or did they remove it? The only way I can assign multiple bundles now is through Gmail. I just tested this and it still works for me. I went back trying to play with the bundles settings and characterize the scenarios in which it works vs the scenarios in which it doesn't work. It seems that the "Bundle messages in the inbox" setting is the key. For bundles that do not have this setting checked, the Done workaround works. If you try to assign multiple bundles that do have this setting checked, it doesn't work. What about being able to RENAME the LABELS !! I do not see any option for it, and no option to open of open and close sub labels. Thanks. Which labels do you want to rename? You cannot rename system generated labels, only user created labels. Sounds like Google has do some modifications to allow for tagging an email with multiple labels without workarounds. I did it for years in the original Gmail client, so I'll be happy when Google fixes Inbox tagging with multiple labels. I don't want to have to use the suggested "bundles" route. Not really sure what you are referring to as this is not a workaround. This is how you can assign multiple bundles to one email using Inbox. I would like it if just once Google would admit that they missed incorporating an important feature, without making it sound like it's some great philosophical new way of processing that eventually us morons will understand. 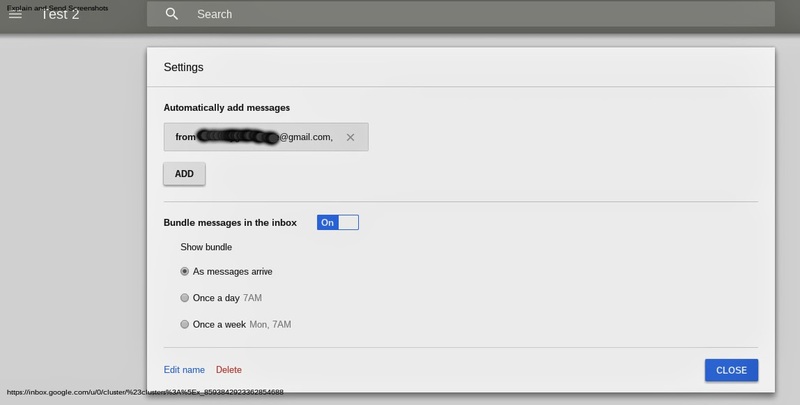 Scott, is there appetite for Google to introduce this multiple-label functionality in Inbox (i.e. just like it worked in GMAIL) or is it a lost cause? What is their official stance on this? I agree with some of the comments on here, that multiple labels is a pretty powerful tool in gmail, so having the same in Inbox would be appreciated. I also appreciate that some users have adopted this new way of dealing with email (relying only on search). But why can't users choose which methodology to adopt as opposed to being left to decide between one or the other? Which is too bad because Inbox has a pretty solid interface. Unfortunately they dont make known what their plans are. Not-done items can't have multiple labels (except if returned back from the done state). Done items can. I think they're mapping not-done item labels/bundles to the gmail multiple-inboxes concept, which are mutually exclusive, and done item labels to good old tagging of archived emails, which can of course overlap. The problem is that at the same time they are introducing states for not-done items like snoozed or sometimes, that are traditionally implemented as archiving+labeling. So not-done is not the same as traditional inbox because it includes long-lived itema -specially those snoozed until someday- that may be worth of multi-labeling, since we're not talking of a handful of pinned emails anymore. I am able to use multiple bundles on brand new incoming, not-done messages. Just need to have the same criteria setup in multiple bundle settings. I understand that but it feels like a special case to keep compatibility with previous gmail rules or to avoid implementing the complex logic that would detect two filter rules might produce multi-labeling. Nothing else in the ui facilitates multi-labeling. I have even changed my mind regarding what I said before, given that done mails are multi-labeled only if you move them from Done, not from a label: this is just a secondary effect of the mail being auto-marked done again. There's another trick I discovered that supports that impression: you can multi-label an item in a search result, and again this is more an artifact of the fact there's no current label in a search result. The overall impression is that these cases are rough edges of a wip implementation on top of gmail labeling. They don't honour the least surprise principle at all, they don't contribute anything but hackish trickery from a usability perspective. I hope Inbox eventually ban multi-labeling forever or embrace multi-labeling in earnest. Recently i tried some gmail alternatives check other email clients like gmail.